Ningbo is the origin of modern garment industry and boasts a large number of both domestic and overseas renowned brands, such as Youngor, Shanshan, Romon, Veken, Beyond, Peacebird, Shenzhou, Xinmingda, Bridge, Aiyimei, Progen, Rouse etc. The textile and garment serve as the pillar industry of Ningbo, where around 4,000 textile and garment enterprises, large or small, are located. Bingbo has long been engaged in the export of the textile products by means of its port advantages, untold foreign trade companies and the overseas businessmen who set their offices in Ningbo. The past few years have witnessed the rapid growth of foreign trade, and the statistics from Ningbo Customs on the first half of the year 2006 show that garments and textile products (including knitting products, yarns, garments and accessories) exported from Ningbo port totals US$ 4.798 billion, up by 27.6% over the previous year. With the steady and sound development of Zhejiang textile and garment industry, as the major textile and garment manufacturing, processing and export base in China, Ningbo along with Shaoxing, Jiaxing, Hangzhou and Wenzhou have formed the largest garment industrial and economic sphere of China, which will inevitably become the competing place of businessmen for its huge market potentials. 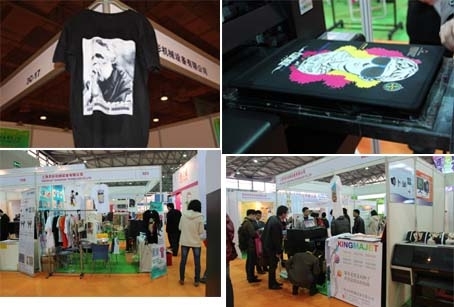 In order to serve the development needs of garment and textile industry, the 5thNingbo International Textile Fabrics, Accessories & Yarns Exposition organized by Ningbo Jiangdong Huayi Exhibition Service Co., Ltd will be held from May 15th to 17th, 2007 in Ningbo International Conference and Exhibition Center. Screen Printing - inks,fabric mesh,squeegee,stencil making material and equipment,screen printing and pad printing equipment, label printing machine. Digital Printing - digital inkjet machine,flatbed digital printer,large-format digital printer,laser plotter, digital printing ink and consumable material. Textile Printing – direct to garment printer, DTG printer, T-shirt printer, digital textile printing machine,flocking machine,hot stamping machine, printing paste,fabrics, pigments,metalic powder.